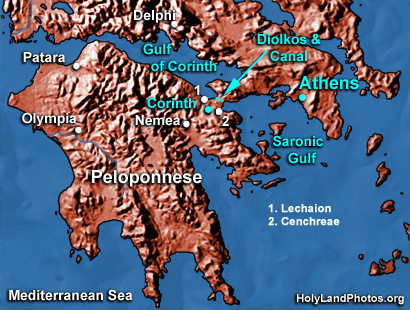 The Corinthian Canal was dug through the Isthmus of Corinth that connects the mainland of Greece with the Peloponnese. It connects the Saronic Gulf (Aegean Sea) with the Gulf of Corinth (Ionian Sea). It is 3.7 mi. [6 km.] long, 75 ft. [23 m.] wide, and its sides rise vertically 300 ft. [90 m.] above the water. This engineering feat was considered by many throughout the ages. Only Nero actually attempted it, but after using a golden shovel to inaugurate the construction he soon abandoned the project. A French engineering company finally accomplished this goal in 1893. To view the ancient equivalent (diolkos) of the canal Click Here.